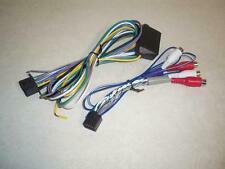 OEM ALPINE Wiring Harnesses. Will fit the following models for Alpine KTP-445U. Original from ALPINE. ALPINE HARNESSES. OEM RCA Harness. 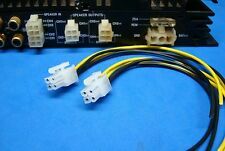 OEM Wire Harness. All serial numbers are being recorded. PLUG STYLE - MALE 8-PIN PLUG. THIS IS ONE 8-PIN PLUG. THE WIRES ON THIS PLUG ARE BLACK AND YELLOW, AND MAY NOT MATCH UP WITH YOUR UNIT. PICTURE - ITEM MAY VARY A BIT IN COLOR SHAPE OR SIZE BUT STILL PERFORMS AS INTENDED. ALPINE INE-W960 INE-NAV-60 GENUINE OEM ALTERNATE RCA HARNESS. GENUINE OEM HARNESS MADE BY ALPINE. IF YOU AREN'T RUNNING AN EXTERNAL AMPLIFIER TO YOUR HIGH END SPEAKERS, THEN THIS IS THE ONLY HARNESS YOU NEED. Illumination (Orange/White). Product SKU: ALP-IVA POWER HARNESS. This harness has 12V Power (Yellow). APO/FPO, Virgin Islands, Guam and All Other U.S. Territories. Put the completed RMA FORM inside the box with your item. ALPINE KWE-663N Extension Cable for TME-M770 BRAND NEW ! Alpine KWE-663N - video / audio extension cable - 11.5 ft. QUANTITY - 2 plugs. PLUG STYLE - MALE 2 4-PIN PLUG. THIS IS ONE 2 4-PIN PLUG. PICTURE - ITEM MAY VARY A BIT IN COLOR SHAPE OR SIZE BUT STILL PERFORMS AS INTENDED. LENGTH - CM ABOUT 15.24CM LONG. BE FOR YOU BUY THIS ITEM BE SURE TO LOOK CLOSELY AT YOUR UNIT, AND MY PICTURES TO SEE IF THIS ITEM WILL FIT YOUR UNIT. NEW ALPINE 4 PIN POWER PLUG FOR PKG-RSE2. THIS IS ONE BLACK 16-PIN PLUG POWER, GROUND, AND SPEAKERS, WIRES. ABOUT 6" LONG MADE TO FIT ALPINE HEAD UNITS. be for you buy this plug, be sure to look closely at your radios plug hole and my pictures to see if this plug will fit your radio. THIS IS ONE GRAY 16-PIN PLUG POWER, GROUND, AND SPEAKERS, WIRES. ABOUT 6" LONG MADE TO FIT ALPINE HEAD UNITS. CDE-100 AND MORE. be for you buy this plug, be sure to look closely at your radios plug hole and my pictures to see if this plug will fit your radio. This item is in very good condition, despite the fact that it is used. This has a detachable face. This system can play CDs, though you must ADD the Alpine CD box. It is not included in this sale. THIS PLUG WILL FIT OVER 225 ALPINE UNITS LIKE CD, MP3, DVD, TUNERS BRAIN BOXES, 5.1 SOUND AND DSP BRAINS AND MANY MORE APPLICATIONS. THIS IS ONE OF THE MOST COMMON POWER PLUGS USED ON ALPINE UNITS. ALPINE MAKES 2 16 PIN PLUGS A BLACK ONE AND A WHITE ONE. This is a 100% original Alpine RCA Cable. Sub Outputs. Rear Outputs. Front Outputs. Up for sale is a new alpine high level input harness. Used - Good Condition / Car Stereo Wire Harness Plug. Back to Top AP6.0. Used - Good Condition / Car Stereo Wire Harness Plug. Hide gallery view. Back to Top AP6.0. Bose Sound System Interface for Select 2014-Up GM Vehicles. Bose sound system interface for X110-SLV or X110-SRA Restyle dash systems. Retains factory Bose amplifier for select GM trucks. Alpine KCX-BOSE-GM. This harness has 4 pair of speaker wires, Amp Remote, Power antenna remote, Illumination, In Int (mute), Acc, Battery and Ground wire. So be sure to try harness to see if fits1st before hooking it up. If your system turns on and off when you are driving then most likely you have a bad RCA Cable installed in your vehicle. This is a Genuine Alpine Part. touch screen. Alpine CDA-9856 MP3 / CD / HD Radio Receiver. Great Condition. Face plate carrying case, Ipod Cable, Mounting Sleeve Included. THIS IS A NEW ALPINE RADIO HARNESS. ALPINE CDA118M. Wire Harness. Fuse Holders. - Factory Radio. Alpine Application Guide - Signal Processors. - Installation Harness. - OEM Harness. 16 Pin harness. - Signal Path Devices. Alpine Power Speaker wiring harness. Alpine Power/Speaker Harness. -Alpine CDA-9883. -Alpine CDA-9884. Blue-Power Antenna. Yellow-12 Volt Battery. We Only Communicate Electronically. Left Front White. THIS IS A NEW , ALPINE RADIO HARNESS. Don't see what you need?. If the item is available will reply with a quote. ALPINE CDA118M. 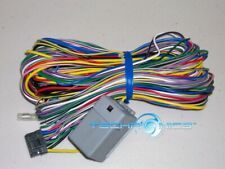 Original part 16 Pin WIRE HARNESS for ALPINE CDE-7821 / CDE-7821R car stereo This is NOT aftermarket, it's an official ALPINE HARNESS CLIP!! So check out the pictures because this harness is in good used condition. This is the real deal. You can see a example of the radio plug that this harness will fit. Our family is here to help. It is in very clean used condition. Ipod cable for Alpine Car stereos. 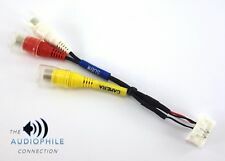 This cable does not work with every alpine head unit so please make sure this will work with your unit before ordering. Condition is New. I am human and can miss things. I got you covered! If you are buying a used item it may have scratches and scuffs. We do our best to note any issues we see but we are human so take a look at Pics. For Alpine KTP-445U. Original from ALPINE. OEM ALPINE Wiring Harnesses. Will fit the following models ALPINE HARNESSES. • OEM Wire Harness. All serial numbers are being recorded. They may have signs of installation but they have been tested and are 100% Functional! If your system turns on and off when you are driving then most likely you have a bad RCA Cable installed in your vehicle. This is a Genuine Alpine Part. it will work with any of these.